If hydrogen is ever going to power the cars we drive, a better and safer means of carrying the colorless, volatile gas that ended the use of dirigibles and zeppelins with the explosion of The Hindenberg must be found. Last August, Timo Thonhauser, an assistant professor of physics at the college in Winston-Salem NC, won a $426,572 grant from the National Science Foundation, a reward and acknowledgment of excellence in teaching and scholarship, according to a post by Reid Creager in The Charlotte Observer. Thonhauser has been working with two graduate assistants since September to study methods of storing hydrogen in a lightweight, compact form for use in transportation. Hydrogen is already used as a fuel for certain industrial practices and rocket propulsion using high-pressure tanks, cold storage as well as chemicals that release the gas when heated. The applications include providing energy to supplement intermittent sources of power like wind generators. The research might even have implications for powering of light rail systems. It is easy to store hydrogen in underground tanks since the weight of the container doesn’t matter – that equation changes radically in an automobile. The professor is researching the optimal ways hydrogen could be used as a fuel in cars, trucks and possibly even airplanes, where weight is the nemesis of efficiency. However, the way Thonhauser and his team are approaching the work is surprising in two different ways. First, their work is not done with labs and physical models, but with pencil and paper plus a whole lot of computer time. The team works on a Wake Forest computer “that connects roughly 1,300 computers at the same time that we ask to do our calculations. They might take months to finish a simple calculation,” he said. Such is the science of quantum mechanics. Second, the principles involved in the research seem to defy the laws of physics at the layman’s level. When you have a vase, you can put a quantifiable amount of water into that vessel. If you then add a quantity of gravel, the volume of the rock is subtracted from the amount of water that will fit in the vase with it. Similarly, when you have a container for gas like hydrogen, it will hold a quantifiable amount at a given temperature and pressure. However, when you fill this same container with certain chemical compounds, it will then hold more hydrogen that it could when empty. These chemical compounds possess the ability to absorb the hydrogen gas in a more condensed state than otherwise possible. Kind of bends your mind, does it not? It is even more amazing that the properties of these various compounds can be calculated through some sort of computer-based, mathematical molecular modeling. The team is researching the viability of using magnesium borohydride; ammonia borane or special alkanes (a saturated hydrocarbon) to provide a safe, efficient means of storing hydrogen. As the Hindenberg incident illustrated, there are problems with hydrogen gas that are multiplied in a pressurized tank. In Eighth grade science we used electrolysis to evolve small amounts of hydrogen into small beakers – reveling at the explosive bark when you passed a flame near the gas. Pressurized hydrogen is highly explosive and could turn a car into a worse deathtrap than the Ford Pinto was ever alleged to be. There are other problems involved even though hydrogen is the most plentiful element in the universe. Though the gas is all around us, it simply is not lying about in a usable form. It is difficult and expensive to separate into the needed form, and then difficult to store until needed. Finally it is not easy to get the energy back out of it – a problem solved to some degree by fuel cell vehicles that produce electricity from the hydrogen’s interaction with the containing medium, but they are still not all that efficient. Then there is the cost of taking Thonhauser’s pure research and moving it into the real world via applied scientific methodology – a process that may take decades. Still the goal is worthwhile – given a way to produce and store hydrogen, burning it will simply produce life-giving water and little else. Assisting grad student Evan Welchman understands the importance of a more sustainable fuel source. Melting ice caps and glaciers, ever more virulent storms and extreme conditions, as well as rising ocean levels underscore the point. Cooler than anything the nerds on Big Bang Theory are up to and that’s for certain. Image: The photo above was taken during the initial explosion of the Hindenburg, showing the 804-foot German zeppelin just before subsequent explosions sent the ship crashing to the ground at Lakehurst Naval Air Station in Lakehurst, NJ, May 6, 1937. The roaring flames silhouette two men, at right atop the mooring mast, dangerously close to the blasts. The scene stimulated NBC radio broadcaster Herbert Morrison to give a memorable and highly emotional account of the disaster. (US NAVY) The image is public domain. Acetylene gas is stored in containers that use a carbon compound to absorb the gas. The tanks hold roughly the same amount of gas they would if the acetylene were just stuffed in there under low pressure (pressurized acetylene creates enough friction on its own to ignite itself). Acetone is used to activate the compound so it absorbs the acetylene at low pressures (2-3 lbs). It's not unlikely that the same can't be done for hydrogen. In the mean time, tanks have been made that are extremely safe for use on a vehicle. Fuel cells are becoming cheaper and have halved their cost in only a few years with new ways of removing the most expensive materials (catalysts) in favor of cheaper, more accessible ones being found, which will further drop the cost. I used to work as a supplier to the largest fuel cell manufacturer in the world (in CT). They had a huge sign that showed the RedOx reaction formula to make a fuel cell work. On the right side, CO2 is a big part of the reaction. CO2 is a byproduct. So what's the point? The reaction of course takes into account starting with a hydrocabon, which is the only energy-viable way to make a fuel cell work. If you begin with water, the energy used to get the H outweighs any gains in using the fuel cell to save energy. Compare using the natural gas itself as the fuel vs any fuel cell set-up and it is clear that they make zero sense - Unless you zap the water using Nulcear power. Try selling that idea in Vermont, California, Mass, etc. What most people have a rough time with is the idea that H2 is energy in its purest natural form. It's, as you say, a storage option so we have to think of hydrogen fuel cells and tanks as batteries. They're much longer lasting and thus cheaper over time than chemical storage, but getting the energy (H2) into them is a more expensive (in energy use) process. For now, anyway. One of the things I've been interested in is the Honda Hydrogen Home and similar projects. The idea is pretty simple: solar panels gather power and send it through household water (usually gray water) and create H2 and O. The two elements are then, separately, sent into home appliances (water heaters, furnaces, and other NG appliances). There they reduce energy consumption by significant amounts. Excess is also fed into a compressor which can then be used to fill the tanks on a fuel cell car. The idea is that using free power from solar to create hydrogen for use in various ways in the home is more effective long-term than is feeding power into the grid (on buyback schemes) or storing it in chemical batteries (which are expensive and degrade over time). Pure H2 can be stored, burnt, or sent through a fuel cell and used and the oxygen byproduct can be vented to the atmosphere or used to further improve burn rates in appliances. Hate to disagree with you, but I have been to plants that manufactured substrates and other parts of PV solar arrays and the fact is there is just not much energy gained. So much energy is consumed making PV arrays and then transporting and mounting them they just don't earn back enough to really change things. Yes, I will agree that there is some net overall energy gained by making a solar panel and then using the solar panel, but I won't agree that is true in areas where the sun isn't out all the time and snow and ice are part of the weather 2 or 3 months per year. Step back a bit and think about the process described above. First, if you can make electrons flow, why not just use them directly in the house? For the fridge (biggest draw usually) and for supplemental hot water and heat and maybe even lights. Do houses create much more energy than they can use when the sun shines? I honestly didn't know they did. If they do, that could jus go into the grid to support other uses. Right now solar is a tiny fraction of our overall energy produced and it is "Wicked local" as we say here in this area. Solar in a space ship or cabin remotely located makes great sense. There is no wire bringing E to the place, so all methods should be employed. Solar where an electric supplier already has placed a feed is really crazy. Never cost effective,and really not much of a NET producer of energy. I should have mentioned that in the Northeast, they're trying the same thing using wind. Where I live, that would be the best option. My brother-in-law in California has solar arrays on his home that power his house, a rental house, and often have some left over during the day. It's entirely possible in some parts of the world for that to be the case. The point is, though, that the hydrogen created (rather than stored or sent into the grid - not nearly as cost-effective as the green pundits would suggest) can be used effectively in other elements of the home (namely heating) and used to fuel a car as well. Good story. My understanding of the physics is that there are two main issues with hydrogen. First, it is not a fuel. It is a fuel storage option. Hydrogen can only be made from hydrocarbons (by stripping it off) or through electrolysis of water. That requires a lot of energy. When that is factored in the environmental benefits pretty much evaporate. Second, since H is the smallest of the elements keeping it where you want it, either in a bottle, or in a fueling station set-up is never going to be a problem that is solved, only managed. The added loss in efficiency due to leakage will make Nat Gas look vey attractive by comparison. Just FYI, I would much rather stand next to an exploding H vehicle than an exploding liquid fuel vehicle (gasoline or whatever). Workers routinely live through gas explosions (natural gas propane, industrial gases etc.). The flash will cause a lot of issues and so will the debris flying around, but then there is not much residual fuel buring. Gasoline has the same concussion and debris issues, but will also get on you and then you will burn up. A lot of what you see in the photo is not the H buring, but the crazy flamable fabric the blimp was made out of. Thanks Mythbusters! Thanks for all the feedback, guys. My conclusion after writing this was if we can use fuel cells to make electricity to run the cars, why not use hydrogen to just make electricity in the first place (if that's viable) and drive electric cars? 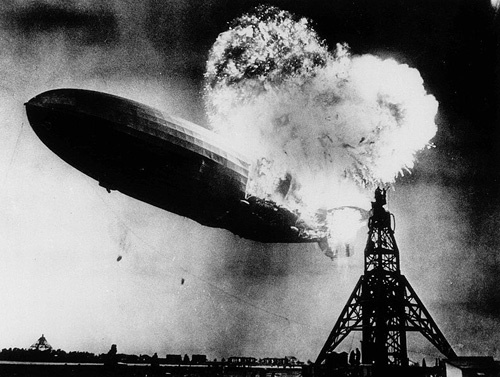 As far as the Hindenberg is concerned, what I got from my research is that static ignited the hydrogen, thus burning the framework, sending the zeppelin to the ground where the diesel fuel used to power the propellers continued to burn for some time. Static, flammable materials, hydrogen and diesel fuel do not a good equation make. But you're right John. Hydrogen burns in a flash and does not leave anything to continue burning unless it manages to ignite something nearby, but I've never seen a car explode except in movies and one semi on the news. Did see a cartoon-like framework of an RV in Yellowstone, It was left when a 50¢ engine part failed setting the big box on fire. Diesel fuel isn't flammable. You can pour it out into a puddle and throw a match on it and nothing will happen but the match going out. It's only flammable when put under high pressure, which is how a diesel engine works. Gasoline, on the other hand.. Hydrogen doesn't burn in the sense that other fuels do. As John points out, it flashes as the H2 combines with other elements in the atmosphere and gives off energy in the process. The biggest advantage to fuel cell vehicles is that they're much lighter weight per kWh than equivalent batteries of any chemistry and have a much longer lifespan than do even the best of batteries for automotive use. Fuel cells also don't have a lot of toxic or potentially toxic materials in them and are relatively easy to recycle in comparison to most battery chemistry. Besides, a 20 minute fillup for 300+ miles of service versus a 4+ hour fillup has obvious advantages. The reason every major auto manufacturer is fiddling with fuel cells and the reason Europe is so big on them is that it's potentially a much more viable automotive fuel source than are battery electrics. Especially in larger, heavier vehicles. Hydrogen also has the advantage in that much of the existing fueling and storage infrastructure can be used or adapted to use for it. True about diesel. True that passenger cars don't burn up many people too. Don's article does highlight that there is this myth that hydrogen is more difficult to make safe than other gases and liquid fuels.